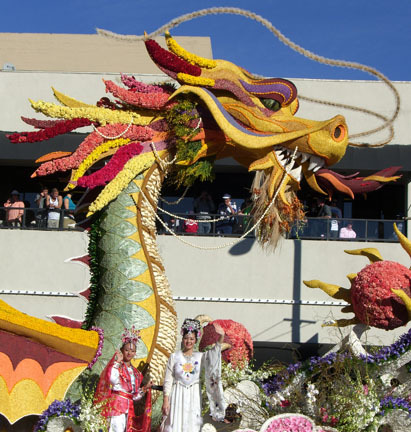 I went to the Pasadena Tournament of Roses Parade! 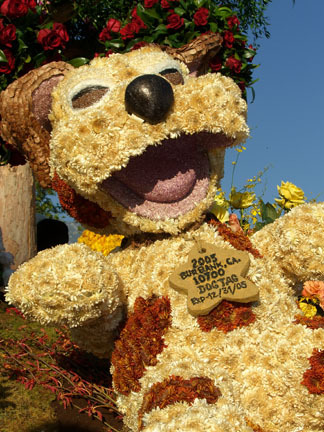 Like many people, I grew up watching the Rose Parade at the start of every new year. 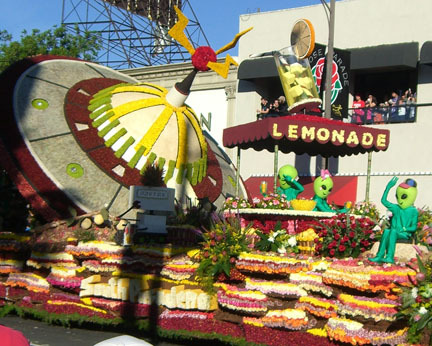 When I moved to Southern California, I thought that I might someday wake up early on parade day and head to Pasadena to see the Tournament of Roses Parade in person. 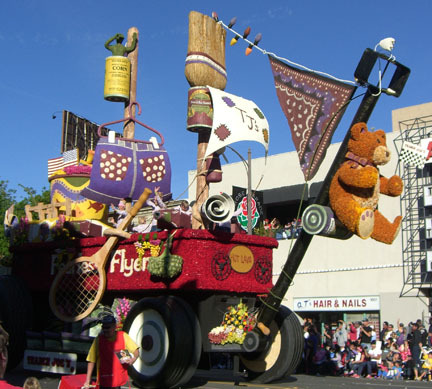 In 2005, I tried to satisfy my Rose Parade viewing dreams by visiting the floats post-parade. I headed to Sierra Madre and Washington Boulevards where the floats are parked after the parade. For less than the price of a movie ticket, I entered a photographer's dream come true. I spent a few hours walking the lines of floats and marveling at the intricate details that the television cameras just don't capture. It was absolutely worth the price of admission, but I missed seeing the float's moving parts in action and the people riding on them. I wanted to see the floats come to life. And so, on Monday, January 2nd, 2012, at about 7AM, I arrived at Los Angeles' Union Station and boarded a standing-room-only Metro Gold Line train to Pasadena. 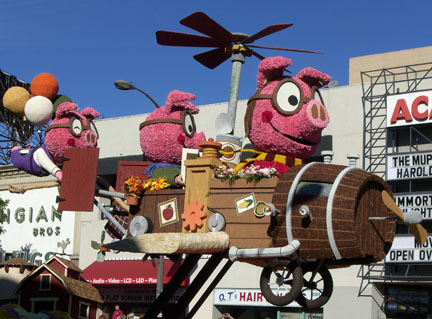 (The Rose Parade is almost always held on New Years Day, January 1st. If January1st falls on a Sunday, as it did in 2012, the parade and The Rose Bowl Game are held on the following day.) At the Del Mar station in Pasadena, I exited the train, met up with a friend, and set off to find a place to take in the parade. I had read online that, on the morning of the parade, unless you camped overnight or purchased seats in one of the grandstands, the only available space to watch the parade would be along Colorado Boulevard east of Lake Avenue. We walked east until we passed Lake Avenue, then we continued north toward Colorado Boulevard. During our walk, a stealth bomber flew over our heads. Our visit to the parade was already taking on an air of excitement and the parade hadn't even started. At about 8AM, the curbs of Colorado Boulevard that we encountered were already filled with people seated on chairs they'd bought from home, but it wasn't hard to find standing room behind them. We settled on a spot near the intersection of Catalina Avenue and Colorado Boulevard. As time passed, I was glad that we were on the south side of the boulevard rather than the north side, with the sun on our backs rather than in our faces. Just before 9AM, police officers riding motorcycles decorated with Rose Parade flags and flowers drove back and forth a few times with lights and sirens to clear the parade route. And then, the parade arrived. ... and Farmer's Insurance's playful look at the many disasters that haunt the imaginations of the uninsured. 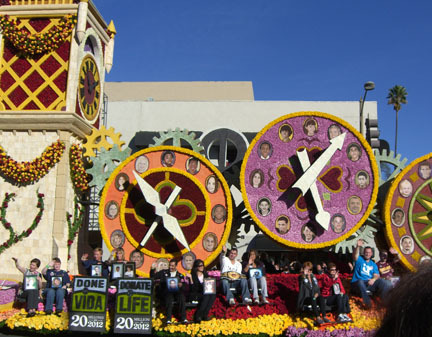 ... and touching to see people whose lives were affected by organ and tissue donation on the Donate Life float. The dog surfing float, which I had been looking forward to, was disappointing. The wave pool was so far above our heads that we really couldn't see what was happening. Between the floats were the marching bands; some of them performed for us. Multiple equestrian units also marched by. Each group of horses was followed by a few people wearing white jumpsuits with a shovels, brooms and wheeled trash cans to pick up the horses' droppings. The "horse clean up crew" was rewarded by cheers from the parade spectators, especially when they were called into action. 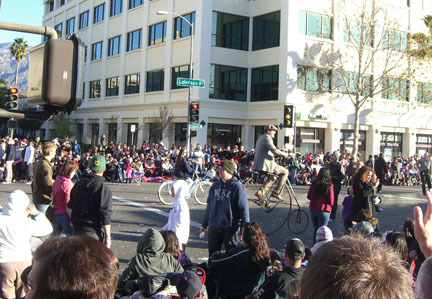 As we watched the approximately two hour parade, I reflected that attending the Rose Parade in person didn't feel exactly how I'd expected it to feel. We were blocks away from the glitz of the TV cameras and Norton Simon Museum with its big rose, standing along the curb of a town that looked like it could be anywhere in America. It felt more intimate that way, almost like we were watching a hometown parade (with gorgeous floats) rather than a world famous one. 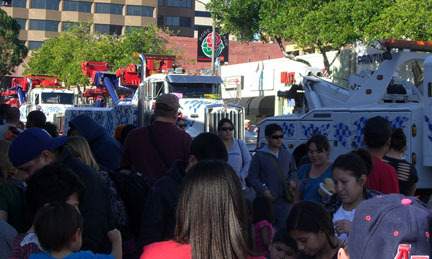 After the final float, there was a seemingly unending parade of tow trucks. It looked like there might be one for every float in the parade. As the trucks passed, horns blaring, the parade-goers began to disperse. We walked down the center of a car-free Colorado Boulevard, something that you can't do on an ordinary day, searching for a place to have lunch. It turned out to be a difficult venture because most of the restaurants on the parade route were closed for the day. We finally found an open restaurant a few blocks away where we watched a repeat airing of the Rose Parade while we ate. After lunch, we watched cars and tour buses line up for a painfully slow crawl toward the freeway. The traffic didn't clear until almost 2 PM. But I didn't have to worry about the traffic; I made my way home on the Metro. I did this most recently in 2013 in Pasadena, California, USA.